A Ranger is an original. Like no other. A Ranger is a symbol of hard work, drive, determination and character. A Ranger is someone very special. He plays with heart. He does not back down from a fight. A Ranger does not fear hospitals. Does not shy away from blood work, intravenous medicines or more tests. A Ranger can beat a fever of 105. A Ranger can survive very little sleep in a noisy ICU. A Ranger can survive a coma. A 14 day coma. He can survive organ failure, even organ shutdown. A Ranger will go through dialysis or a ventilator if they are needed to help him. But, a Ranger cannot do it alone. He needs family, friends and a great, great deal of support. 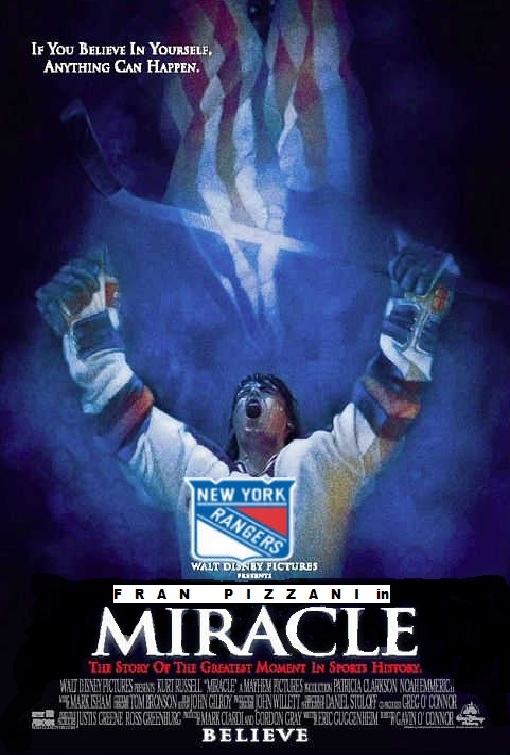 We’ve all seen the Rangers raise their sticks at the end of a win to the Garden faithful. I have always loved that. It always made me feel like I was a real part of that win. I am writing this to thank all of you for all of your support through all of this. I have read all of your comments over and over again and have been crying like Mark Messier during one of his speeches. I am overwhelmed by all of you. The Ranger community, actually, even better, FAMILY, has amazed and inspired. I am so, so grateful to The Dark Ranger and to each and every one of you for all of your comments and support. I thank you from the bottom of my heart. I have been home for 6 days now after close to 30 days in the hospital. Most everything is a challenge. Just getting dressed can be exhausting. Walking 8 blocks was like climbing Everest. But after all of the love and support I have seen, I am not backing down. I will chase the puck, I will I charge the net, I will finish my checks. Yes, I will drop the gloves and fight to get my life back. THIS IS HUGE! WELCOME BACK TO THE LAND OF WINNING!!! WE ARE BROTHER IN BLUE FOREVER. Welcome home Fran. Keep up the fight. You are the man. Welcome home buddy. Glad to hear your voice. You got me balling just like Mess. Best of wishes And thank you for defining what no other sports fan can understand. Also, you have a name that sounds like a Ranger. Fran. Great fight. You made it and we all will continue to pray for you. God Bless you Fran and your family. Keep diggin' Fran. Pain is just weakness leaving the body. Fran I am so proud of you, from one Ranger fan to another, keep fighting and keep winning!!! !